Day Temperatures will drop by 2/3c in North West and North India Including Delhi NCR from 5th April. Vidharbh and adjoining Southern MP will remain hot. vijay: Bangalore will remain in the 35/36c range till Thursday at least...light rain expected on Thursday. 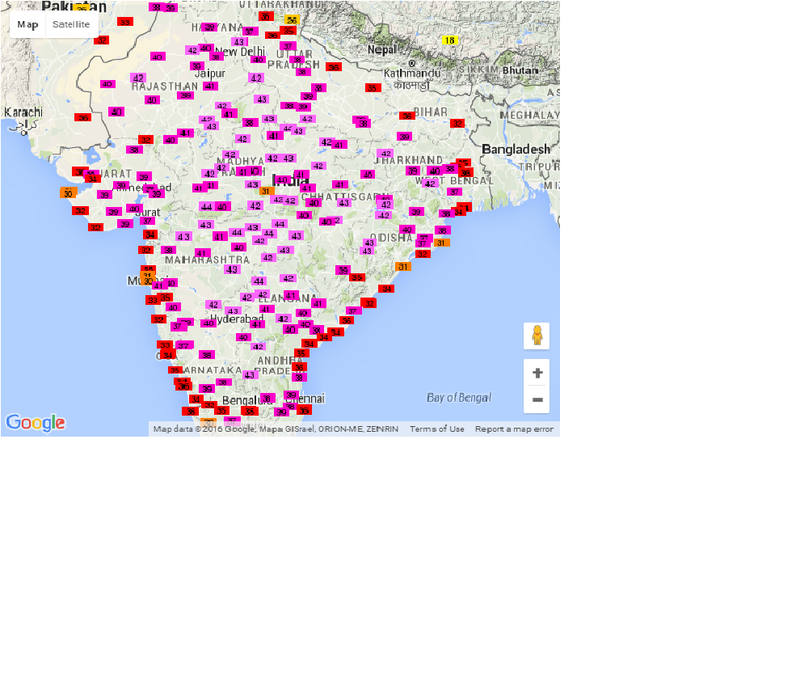 KAR and AP are getting more hotter than Rajasthan. GUJ remains cool. Bangalore mirror says sunday BANG touched 38c. APRIL/MAY excepts KAR all time high of 48c ! Time of weather/water risk management KAR govt to wakeup for env/eco destruction. Awaiting master stroke on 10th April MW 1 for the SWM 2016 begining with your accurate forecasting after IMD saying it would be a normal monsoon year in newspapers yesterday. I would say it was not an surprise rain as myself & Vagarian Puneet were tracking it from past 3 days but ya didn't mentioned here as it was going to be very isolated activity or just medium level cloudy to some thunderheads visible in East sky as there was LWD running along of Western ghats.. But yesterday LWD tilted diagonally from Vidarbha/Marathwada towards Goa coast and suddenly 700 hpa chart indicated trough formation due to wind confluence from S.MP to NW Maha towards Mumbai-Konkan dipping into Arabian sea. This help in for moisture incursion from sea and resulted in isolated Rain/Thundershower in parts of N.Konkan today early morning.. Also as it is temporary development so cloudy weather to drizzle may persist till 3pm then later clearing up for Konkan region.. Madhya Maha may see isolated Thundershower activity for next 24hrs & Marathwada/Vidarbha for nxt 48hrs..
Bangalore at 36.7 today. We are continuing with the unprecedented hot summer. 1) So far on 31 days temperature crossed 34c . The count of 31 days above 34c by April 5th is quite unexpected. 2) Of the 31 days when the temp reached 34 and above , on 19 days temp reached 35 and 36. Though people can state that Bangalore has witnessed 35-36-37 before, the act that we have witnessed 19 days with 35 and above is out of ordinary. That too so early in April. Rajesh sir,in your monsoon watch note which is to be published on 10th of april ,i want you to mention forecast of places like panvel,pen,roha too.i want you to mention onset date.thanks in advance. abizer: The Monsoon Watch series is in the 7th year running now. It has a fixed format. Initially the format and methodology is explained. The dates and quantum are analysed after the MW-3/4. No specific place is ever mentioned as it is an overall study document.